Lencrow Group introduces its new range of pedestrian reach stackers designed for use in small to medium business applications. Tested for over 12 months, the new Lencrow pedestrian reach stackers offer superior operator safety and ergonomic operation. 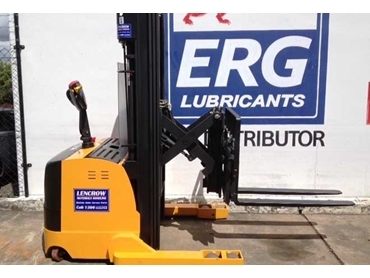 The forklifts can be used without operator licensing, with operators only requiring proper instruction in the operation and safe use of the equipment. The new Lencrow pedestrian reach stackers incorporate features, which are usually available only in more expensive larger units. These include power steering coupled with step less AC drive making the unit easy to operate for all drivers in addition to fingertip control for all hydraulic functions and side shift standard on all models. The unit’s AC operation offers long duty cycles between charging its 320 amp hour battery while causing very little harm to the environment. The stackers are available in lift heights to 5500mm and a nominal capacity of 1500kg, making them the ideal solution for many operations. Ross Grassick, General Manager of the Lencrow Group explains that the stacker has been designed to be user-friendly and affordable to suit the needs of all business segments.